CrowdFlower is a cloud platform for training AI, machine learning, and human-in-the loop. It is powered by Azure Machine Learning by Microsoft, making it a user-friendly application where users can simply drag-and-drop objects across the interface. With CrowdFlower, data science teams can perform sentiment analysis, make search results more relevant, and business data more organized. This allows them to truly understand their market and turn their data into comprehensible sets. Moreover, CrowdFlower allows a company’s data science team to streamline their workflows as the platform takes care of redundant tasks. This also lets them funnel most of their efforts and utilize their expertise on difficult cases. Computers may not be able to replace humans completely at work, but they can empower users and augment their skills. With CrowdFlower, businesses can create a synergy that results in machine learning models making accurate predictive judgements while humans focus on other tasks and aid the models in learning. Business workflows are not only automated and made faster, they are also more accurate compared to only either humans or machines working alone. CrowdFlower is built on Azure Machine Learning, which means the platform is powered by powerful predictive models in the cloud. This lets users access top-notch algorithms and allows them to work in an interactive interface where they can easily drag-and-drop objects for further model optimization. With CrowdFlower, businesses can robustly safeguard their brands against attacks or possibly harmful content. The platform integrates with a company’s platform where it can moderate comments, profiles, posts, media, and more so only acceptable content make it to the website. CrowdFlower collects data regarding customers, leads, opportunities, and the business’ operation to swiftly provide relevant information. On top of that, aggregated information is categorized according to a company’s own hierarchy or settings. This makes finding things faster and turns up needed data more rapidly. Gone are the days when users must slough through irrelevant search results to get to the item they need. CrowdFlower’s data enrichment capability assists commercial entities in consistently providing pertinent search items for their customer base. CrowdFlower is a robust platform that is capable of gathering customers’ or users’ sentiments. 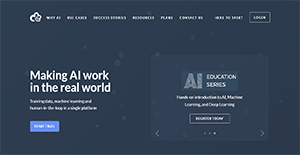 The combination of human and machine intelligence enables the platform to gain insight regarding any topic and also trains machine learning models to eventually categorize answers based on how people feel. CrowdFlower can transcribe business data coming from diverse sources into readable transcripts. The platform’s contributors carefully look at uploaded media and offer diverse judgements on things that need to be subscribed. This gives businesses the assurance that they receive an accurate transcript of their information. CrowdFlower has multifarious use cases and can be utilized for varying industries. All customers need to do is get in touch with the platform’s representatives and speak with them regarding their business needs. Afterwards, the platform and its contributors work to provide the best service they can. If you are interested in CrowdFlower it might also be a good idea to analyze other subcategories of Best Artificial Intelligence Software gathered in our database of B2B software reviews. Every organization has different wants and requires an application that can be personalized for their size, type of workers and customers, and the particular industry they are in. For these reasons, no system can offer perfect functionality out-of-the-box. When you search a software app, first be sure what you want it for. Read some CrowdFlower reviews and ask yourself do you need basic functionality or do you need sophisticated features? Are there any industry-specific features that you are looking for? Obtain the answers to these questions to assist your search. There are multiple elements that you need to reflect on and these include your finances, particular business needs, your company size, integration needs etc. Take your time, try out a few free trials, and finally zero in on the platform that provides all that you require to enhance your company efficiency and productivity. How Much Does CrowdFlower Cost? CrowdFlower offers the following plans for users to choose from. Contact the vendor for an enterprise pricing packages that best fit your business. We realize that when you make a decision to buy Artificial Intelligence Software it’s important not only to see how experts evaluate it in their reviews, but also to find out if the real people and companies that buy it are actually satisfied with the product. That’s why we’ve created our behavior-based Customer Satisfaction Algorithm™ that gathers customer reviews, comments and CrowdFlower reviews across a wide range of social media sites. The data is then presented in an easy to digest form showing how many people had positive and negative experience with CrowdFlower. With that information at hand you should be equipped to make an informed buying decision that you won’t regret. What are CrowdFlower pricing details? What integrations are available for CrowdFlower? CrowdFlower provides access to its APIs to all its users. For more details, contact support or see the platform resources. If you need more information about CrowdFlower or you simply have a question let us know what you need and we’ll forward your request directly to the vendor.